Mobile Electronics is your source for today’s best Bluetooth technology. You demand performance and convenience - simply stock will never do - ever. Incorporate a bluetooth solution into your vehicle and take control of your vehicle entertainment experience. Through an in-dash head unit or separate accessory, Bluetooth allows hands-free calling, iPod control and the ability to stream crystal clear HD radio and music via services like Pandora and Spotify. Investing in a Bluetooth solution will allow you to seamlessly integrate cell phones and mobile devices into your vehicles. Learn about the most popular built-in and accessory Bluetooth options below. Check with Mobile Electronics today to learn more about Bluetooth solutions. We’re sure to have something that will work perfectly for you. If you already have a stereo in your car and don’t want to upgrade to one that includes Bluetooth, don’t worry – you can still enjoy Bluetooth capabilities without spending a fortune. We offer a variety solutions, like the Parrot CK3000, that can be hidden behind the dash, so it won’t clutter up the appearance of your vehicle. You don’t have to integrate your car stereo with a Bluetooth device if you don’t want to do so. 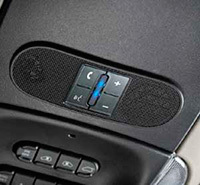 For one reason or another, you may just be looking for a way to make and receive hands-free calls and for that, we have the BlueConnect visor-mount system. For an in-dash receiver option, we also offer many head units by Kenwood and Pioneer with built-in Bluetooth solutions that work from within the dashboard of your vehicle. With them, you can play CDs in your car, connect your iPod and bring your favorite music with you or stream music from services like Pandora and SiriusXm Satellite Radio. Of course, it also works as a hands-free mobile device, allowing you to make and receive calls through your in-dash car stereo. Ask a Solutions Specialist for more options, like in-dash DVD and GPS navigation units. Parrot, a world leader in wireless devices for mobile phones, stands on the cutting edge of innovation by providing high-quality, user-friendly wireless devices that interact seamlessly into our everyday lives. 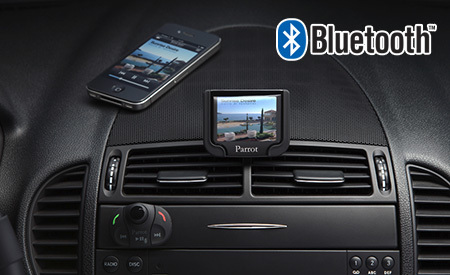 Parrot has developed the most extensive range of hands-free systems on the market for cars. Its globally recognized expertise in the fields of mobile connectivity and multimedia around Smartphones has positioned Parrot as a key player of in-car infotainment. Phone book: up to 150 contacts per telephone, up to 450 in total per system. BlueConnect® is a wireless, in-vehicle hands-free system that is integrated into your vehicle’s interior, either in the overhead console or headliner, giving it the appearance of being factory installed. It is one of the clearest, easiest to use hands-free phone systems in use on the roads today, allowing drivers to keep their eyes on the road and hands on the wheel. One-time phone pairing to BlueConnect, the system will automatically recognize your device upon starting the vehicle. Hands-free calling using voice commands. Enter and exit the vehicle without losing connection. Pair up to 7 Bluetooth phones. Built-in noise and echo cancellation. 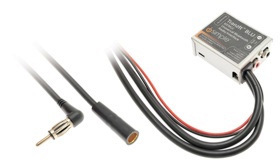 Compatible with any FM radio, factory or aftermarket.  Wireless streaming of music utilizing Bluetooth technology. Infinite channel selection through free phone application. Interrupts incoming antenna signal when in use for supreme audio performance. Auto turn on/off, no switch needed. RCA audio out for compatible radios with aux audio input.